Emerging artists of the cohort attend a printmaking event with Rise Indigenous Survivance and Empowerment. Beyond painting and weaving, beyond sculpting and carving, there is a business component behind art that is imperative for art to continue to be shared and valued. 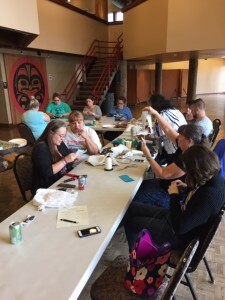 At the United Indians of All Tribes Foundation in Seattle, Washington, there is a growing awareness of Native artists’ need for skills in communication, collaboration, marketing and sales. And here artists are finding a resource for professional development and a hub where they can learn, create, grow and excel as professionals. It’s happening through the Emerging Native Artists Cohort. Funded in part by First Nations Development Institute’s (First Nations) Native Arts Initiative, this cohort builds on United Indians’ momentum in providing educational, cultural and social services that connect Indigenous people in the Puget Sound region and fills a vacuum prevalent in the artist community – the lack of resources to create and share art successfully. According to Melissa Keller, United Indians’ Development and Communications Coordinator, while there are many Native artists in the area with great talent and aspiration, a substantial number are limited by the economic disadvantage experienced by many Native Americans. As a result, these struggling artists do not have the means to buy art supplies or put together portfolios, let alone market and sell their work. Further, United Indians learned through its community-wide needs surveys that constituents deeply valued access to Native artistic and cultural learning as a crucial component in protecting and strengthening their identity as Native people. Since its founding in 1970, United Indians has actively promoted Native culture and art. United Indians’ headquarters at Daybreak Star Indian Cultural Center in Seattle’s Discovery Park is home to the only Native-operated and Native-owned gallery in Seattle, the Sacred Circle Gallery, which produces up to four exhibits a year by Native artists. Emerging artists Corinna Strasso and Rebecca Cesspooch at the Indigenous Womxn’s Love & Pain Exhibition opening. Yet United Indians knew more could be done to address emerging artists’ need for financial and programmatic support, and the community’s desire for cultural connection. Project Lead and Arts Program Manager Hank Cooper collaborated with United Indians leaders to explore opportunities. Cooper said this need helped direct United Indians’ efforts. First Nations provided not only funding, but expertise and guidance along the way. What resulted was a formal cohort of emerging artists who would receive training in how to launch and develop their careers, from creating an artist’s statement and exhibition proposals, to applying for fellowships, grants and artist-in-residence positions, to devising strategies for pricing, marketing and sales. 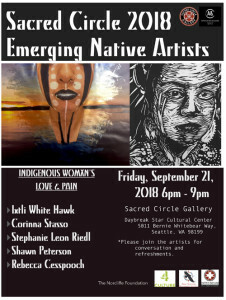 As part of the project, several emerging artists of the Cohort present at the Indigenous Womxn’s Love & Pain Exhibition at the Sacred Circle Gallery. Another objective of the project was to empower these emerging artists in the cohort to put this knowledge into practice by displaying their work at the Sacred Circle Gallery. This involved positioning their pieces, installing exhibits, and handling the presentation and direct sales to the community – all skills needed to make a living as artists. The cohort artists were also hired to present workshops to Native and other members of the community across all age groups. The benefits of these classes in Native painting, sculpture, carving, beadwork and other artistry were twofold. 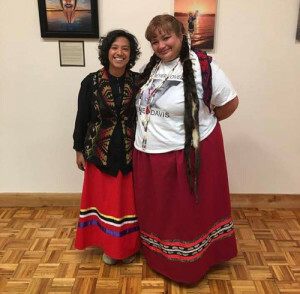 One, the workshops shared and showcased authentic Native art and not “Native-inspired” art – a distinction Keller said is important in conveying the Native perspective of the Native world versus the Native world as it is perceived by white people. “Too often a simple story that is conveyed through art ends up twisted, so that it’s no longer specific to a tribe,” explained Keller. The workshops passed down this traditional knowledge, which in the past had been lost or diluted. 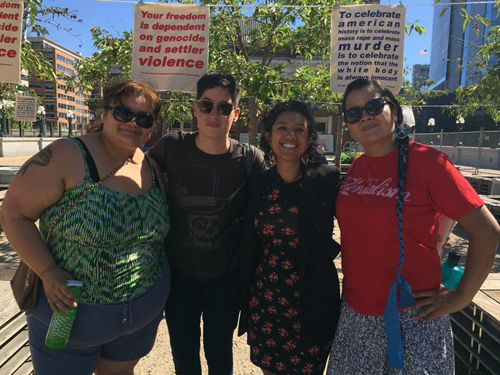 Indeed, United Indians was formed to serve the many American Indians and Alaska Natives who live off tribal lands around Seattle and thus face increased challenges in connecting to their tribal heritage. Learning about art firsthand promoted those cultural connections and sharing of history, said Keller. 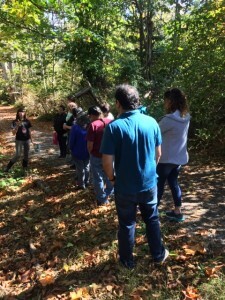 Stephanie Leon Riedl brings participants outside to search for Native materials to use in her weaving workshop. Second, the workshops provided a forum for emerging artists to talk about their work and promote themselves as professional artists, which many of them had never done before. Since the cohort was launched in December 2017, the project has engaged eight local artists, provided over $3,500 in artist materials and supplies, and produced four workshops, reaching more than 60 participants. Artists have expressed appreciation for the project’s support for both artistic development and business skills. Emerging artists have learned skills in networking, marketing and sales, and have gained new knowledge about how to make art a professional career. Cohort artists have gone on to display and sell their work, many for the first time ever. Moreover, the artists’ teachings have enhanced other educational programs at United Indians and have helped perpetuate art and culture among scattered and displaced tribal members of the Pacific Northwest. Corinna Stasso teaches the art of making medicine bags. Cooper hopes the progress so far is just the beginning. She envisions United Indians and the Sacred Circle Gallery to be a home base for local Native artists – a place where they can sit together, build a community and “hold each other up.” She sees the cohort evolving over time with more artists participating and more regular exhibits and workshops being held. This entry was posted in NL11 by rblauvelt. Bookmark the permalink.